Which Recreational Sport Started As A Form Of Physical Therapy? In Which Game Did Mario Make His First Appearance? Although small footbags have been used by cultures around the world for centuries, the runaway success of “Hacky Sack” as a recreational sport (however laid back it may be) owes all its popularity in modern times to how well it works as a physical therapy aide. In 1972, John Stalberger was on vacation in Texas when he, while attending a local festival, became friends with Mike Marshall. The two hit it off and Marshall introduced Stalberger to a simple footbag game that he had learned from a Native American he’d met in the military. The enjoyment of the game aside, Stalberger was extremely impressed with how well the act of playing with the footbag worked as therapy for an old knee injury. The two of them, Stalberger especially, became obsessed with playing the game (which they dubbed “Hacky Sack”). 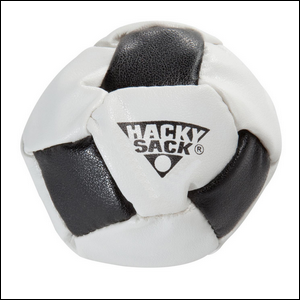 In short order they were designing prototypes for more advanced footbags, playing with family and friends, and by the mid-1970s they had a business under way with thousands of Hacky Sacks produced. By the early 1980s, the game had gathered enough momentum that toy company Wham-O bought the North American distribution rights and began marketing it alongside their other popular casual-recreational toy: the frisbee.